It’s cold and wet and evening and November and as I sit in the back of Shakespeare and Company in the warm tiny alcove of the poetry section, its thin wrought-iron gates swung open and seeming to invite just one person at a time into its little space, while a stranger above my head plays a tune on the upstairs piano that’s slow and pretty and thoughtful with lots of bubbly trills and surely something Baroque I figure, and the warmth of all the old wood and paper around makes the rain and cold seem forever away and I’ve again tripped backwards into momentary perfection and I play the game once more foolishly where I dream of holding onto it, though I have as much chance of that as I do of putting one of the bubbly trills from above into my pocket and taking it home with me, I finger the binding of the nearest small book which is a collection of Yeats and I pull it onto my lap and leaf through unfamiliar verses. By now I’ve kept the alcove to myself for some time and others with body language signal their interest in it and my curiosity won’t subside so I climb the narrow worn stairs, the stairs that are the kind of secret that isn’t a secret to anyone anymore, and I move slowly without creaking the floor to the room with the piano and the player’s back is turned to me but I pretend anyway that I’m just looking for books. Two others had the same idea and they’re already sat one on either end of the piano and I already envy them for the time they’ve spent so far as I take my place on a makeshift bench made of a long wooden box with a worn mattress on top of it, still behind the pianist, and I type what I see and feel and as I rediscover this small room which is just as warm as all the others I’m filled up with piano sounds and the sight of the exposed wooden beams overhead that are dry and pale and warped and cracked and soaking up just as much of it all as any of us are. I decide that I not only should have been coming to this room more often since arriving to Paris but that I should have been spending my entire life in it, if such a thought dare be thought aloud, and in the cloud of fugal harmonies and pale wood and the half-broken pointed archway cradling a stack of dusty books in the corner I’m already sad that it will have to end eventually. There’s a chess set scattered on the table in front of me and not all the pieces match and I still don’t know which composer I’m listening to and during the pauses between each piece I contemplate asking the pianist but I never do because I refuse to be the one who breaks the mood with something as frivolous as a human voice and it’s a marvel as I look around again at the city’s power to hold onto authenticity in spite of itself; here in the most touristy neighborhood in the best-known bookstore and just across the river from Notre Dame I’ve managed to find such a natural and unhindered tranquility in the middle of all of it and it’s just me and three voiceless strangers respecting silent pauses and oddly I’m as connected to them right now as I’ve maybe ever been to anybody. I’m expecting text messages and I see that my phone doesn’t get service in this room and I should probably go downstairs to let it catch up to rest of the outside world but there’s the cold and the wet and it’s November and there’s no piano outside and again I refuse to break the spell. The pianist eventually stops for good and gathers all his sheet music and picks up his bag and I can’t stay quiet any longer and I need to know which composer that was so I say to him merci and c’était beau and super and I realize he’s even less comfortable with French than I am so I ask in English who wrote the music. Francois Couperin he shows me, and I thank him again and say goodbye and he moves to leave and I start to gather my things also to head downstairs but then he reappears and seems eager to share a bit more. He takes a seat beside me and says he’s from Greece but has always loved French Baroque music and he normally plays the harpsichord instead of the piano and has played it all his life. He is friendly and thin and tall with black greased hair and a rosy complexion and he explains how a harpsichord player is ’naked’ because you have no sustain pedals like a piano and he seems proud of this and is therefore, I figure, probably a fine player of the instrument. He elaborates on the workings of the harpsichord and I tell him I played guitar for many years and he says “so you must know what I’m talking about” and I’m not sure I do but it doesn’t really matter. He asks me for a cigarette but I don’t smoke and neither does the guy who just took his place at the piano to play an Impromptu by Schubert so the friendly thin Greek bids me a good evening and leaves and I soon make my way downstairs and goodbye to the poetry alcove and I’m outside again. I walk north and hurry to finish my notes before I forget what happened and by now I’m walking across an unusually unlit Notre Dame because of an outdoor installation that will soon help celebrate her 850th birthday so it’s me and my walking and my typing and my notes and a dark cathedral against a dark sky and it’s still cold and wet and it’s still November, but as I see it I just dropped one of my little coins into the fountain of history and added another meaningful instant to a string of meaningful instants that none of the pedestrians care about as they now pass me on this damp bench on the Pont d’Arcole, and my fingers are too cold for much more typing so with my own tiny imperceptible crescendo I consider the moment to be officially passed and the illuminated statues of the great men of France cemented to the Hotel de Ville who look down on it all seem to concur. I try not to conclude it all with a clichéd Paris you’ve done it again but I have to, because it has. And I walk away with my new story and my own little piece of Shakespeare and Company and I feel just a bit closer to its mythos and I feel allowed to now call it a spot of mine and I feel I deserve to come back as if the store and I are lifelong friends, which maybe I will and maybe we are. I like your free-flowing style and your poetic depiction of this special place. With the original hardcovers nearby and the Baroque music filling the room, you couldn’t have asked for more. Thanks a lot for reading and commenting, take care. Thanks for the comment Emily. It was a special moment, one of those you couldn’t have planned if you tried, and I’m glad I took the time to go upstairs and let it play out. Thanks for reading. We can be so utterly captivated by this city and the magic of it; or perhaps captivated isn’t the correct word, but intoxicated. Intoxicated with Paris, all she was, is, and will be. Here, there is endless potential for absolutely anything and everything. The city can be magic. Thank you for sharing your story, and the beautiful stream-of-consciousness writing today; your blog never disappoints! Yes Chantal, intoxicated is a good word for it. It’s a cliché to say it but the truth is all you need to enjoy Paris is to walk around and follow your eyes/ears/stomach and just pop into whatever shop or courtyard or café grabs your attention. Odds are you’ll walk away with a little experience or story and a greater appreciation for the magic of the city. Frankly part of me keeps waiting for the charm to wear off, but it never does, and maybe that’s the real amazing part. Thanks a lot for commenting, glad you enjoy the blog. I have to tell you: as a rule I don’t subscribe to blogs anymore (information overload). But I decided to subscribe to yours based on your wonderful Picasso article. This was the first post that landed in my inbox, and reading it made me very glad that I subscribed! Thanks so much Barbra. I know exactly what you mean about subscribing to endless stuff, so that makes me all the more grateful that you clicked the subscribe button. Getting anyone to stop a few seconds to notice anything nowadays is quite a coup. :) I’m tickled (and a bit relieved) that you didn’t feel spammed by the first post to arrive in your inbox! Thanks for your continuing encouragement and take care. Oh, this was wonderful! As much as I love the idea of Europe, I love even more the idea of America and I wonder if those who visit or come to live here from other countries are so enchanted by our history? I know I am but perhaps that is because I have, like you, been allowed to get to know these two parts of the world on my own. Good question. I often think about how Europe and the U.S. differ in their relationship with history. It seems every week there’s some event in Paris or something on TV or a magazine going in-depth into a historical period, and I just don’t remember much of that happening back in New York. Just the other day I was explaining the story of Thanksgiving to some Parisians and they seemed pretty interested, mainly because it differs from their own culture. The same goes for the Wild West and cowboys and all of that, because again for them it has a fairy tale quality. Aside from that I’m not sure how interested French expats who live in the U.S. are about our history, like you I’d be interested to know. Thanks for stopping by and take care Dena. Beautifully written! 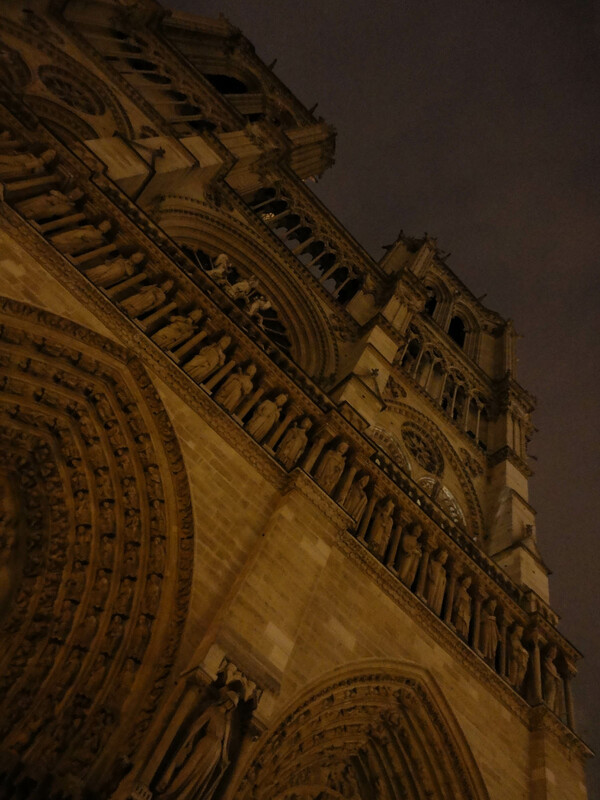 Your flowing prose reminded me of some of the stream-of-consciousness experiences I’ve had in Paris — and made me feel as though I’d shared yours, as well. Thank you for whisking me into a sublime moment in another time and place. You’re very welcome munro, and thank you for reading! Getting excited for your trip yet? A wonderful experience in a wonderful bookstore — and I liked how you described it. 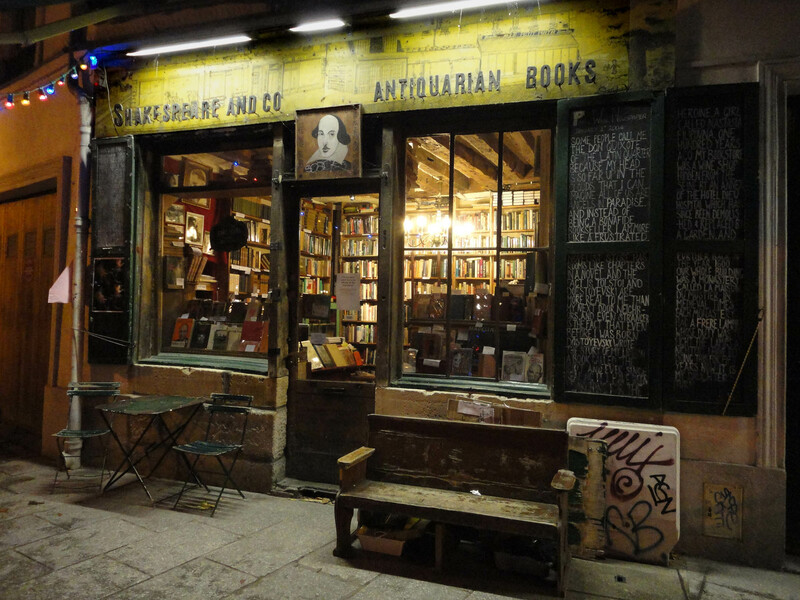 When I visited Paris, I only spent a few days there, and Shakespeare and Company was certainly one of the highlights. It’s a treasure. Thanks zookyworld! Glad you like it. As someone with an adequate but hardly poetic writing style, I am so impressed with your writing in this article. There is so much to treasure in Shakespeare and Company, but the highlights from your heart as you experienced it are the best. Good job! Thank you feemail! I tried to minimize the “prettying up” of it when I got home, and tried to keep it as close to my original notes as possible so it would stay fresh and a bit raw. I’m so glad you liked it. Happy to hear from you, take care. Beautiful, Co… I enjoyed this writing style, slightly differing from your norm. A continuous stream into your consciousness. My heart raced as I continued to read. So rich. I think I can even smell that room. Thank you for capturing such an honest moment, thank you even more for sharing. Well done. Thanks Nic, I tried to go with a style that would suit the subject a bit better and help convey the mood of what I was feeling that night. Reading the comments, I’m happy to see that I was able to get that across, at least to some extent. Thanks for the comment! Thanks for taking me with you to another magical place. I could see it, hear it, smell it, and could even feel the November chill. C’est magnifique! That’s great Linda, thanks for the comment. If my writing awakens a few senses along the way, then perhaps I’m on the right track. :) I’m really glad you enjoyed it. Thanks for stopping by! This was absolutely beautiful – and relatable in so many ways to those of us spending time in this city. The cold, the wet, the happenstance meetings that mean so much but are so fleeting. Great post. I was going to write a post about Shakespeare & Co. soon, but it looks like you beat me to it. The whole time I was reading this I was just screaming “YES!” in my head the entire time – everything you wrote completely fits in with the experience I had myself. I had the privilege of attending a few tea parties at the bookstore and I met some people there I will never forget. I wish I’d spent more time there – every visit is really something to treasure. And if you’re interested, Time Was Soft There by Jeremy Mercer is a marvelous read about not only the bookstore, but the life of George Whitman as well. Thank you Rita, I’m glad you enjoyed reading. Tea parties at Shake & Co? Sounds nice indeed. Thank you for the book recommendation, I’ll check it out! Oh this post brings tears to my eyes and fond memories to mind. Thank you thank you… what a wonderful place. You’re very welcome. Yes it’s a special place and I should visit more often. I had no intention of writing about it but once I got there and heard the piano and took in the vibe, I couldn’t help myself, I just whipped out my iPod and starting typing. Wow, your writing is sublime. You painted an entire scene for me in my mind and I felt like I was sitting there with you hearing that piano. These are the moments that make traveling and living abroad so totally special, but only if you recognize and embrace them as you have so beautifully done. I look forward to reading more. Merci! Thanks a lot, glad you liked it! Yes it really depends on how you choose to look at it, because not everyone treats travel the same way. If you stay open to the little details or happenstance moments, they can often be more fulfilling than the huge monuments that fill up our tourist to-do lists. Connecting with the city through a personal way, like a pit-stop in a charming café or a talk with a stranger or discovering a tiny courtyard off the beaten path — that’s the kind of thing that sticks with you and stays in your memory. Thanks for your kind words and I hope you continue to stop by. Take care! We had caipirinhas in highball glasses and listened to the bar pianist play a fantastic cover of Adele’s Someone Like You. I felt like some sort of very glamorous- albeit phlegmy- mob boss’s wife and wanted to drape myself over said piano with a cigarette holder for dramatic effect. Mr. M suggested that I decrease my dose of decongestants. The last time I was in Paris, my favorite moment occurred inside Shakespeare and Co. I was in the film-section, and the moment was perfect. This amazing bookshop, which shows once and for all what a real bookshop is supposed to like: wood, and ordered chaos, and music, and pillows, and ladders that you can move around, and books all the way to the ceiling. And someone’s playing Dawn from Pride And Prejudice, and I am so proud of recognizing it, and I want to leave before it’s finished so I don’t have to endure the agony of something else beginning and leaving Pride And Prejudice behind, and the moment was perfect. And then, when I tell myself to leave, and skim the shelves in front of me one last time, I spot it: the book I didn’t know I had been looking for until I recognized the text on its side: “you couldn’t ignore me if you tried.” I almost ripped it off the shelf, and took in its magnificent front and back, and hug it to me, and contemplate the reality of having a shoestring budget for the next two days because of it, but I buy it anyway. Because the moment was perfect. Wonderful! Thanks for such a great comment Em. Sounds like you had a similar experience; I guess this store does that to people. :) And your “ordered chaos” description is dead on. Happy you enjoyed the post! I much prefer intfvmaoire articles like this to that high brow literature.